Families of homeless men who were killed in crash reach settlement. 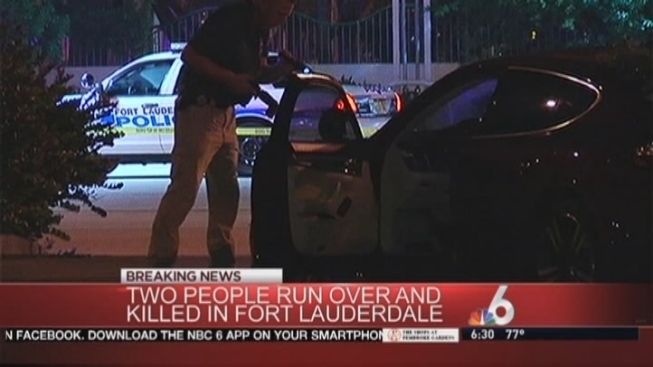 The families of two men who were struck and killed by a Porsche in Fort Lauderdale earlier this year have reached a $2.2 million settlement in the case. Mackendy Jules and Samuel Martindale were killed in the June 13th crash in the 500 block of W. Broward Boulevard. Alyza Rachel Russell, 22, was arrested on DUI manslaughter charges in the crash. According to police, a toxicology report shows Russell was more than twice the legal alcohol limit when she tried to make a left turn in her mother's Porsche Panamera but lost control and drove into a nearby parking lot, killing the two men. Russell was arrested and later released on $450,000 bond. The criminal case is still pending. The woman who struck and killed two pedestrians in Fort Lauderdale last month was arrested on DUI manslaughter charges Wednesday after a toxicology report showed she her blood alcohol level was more than twice the legal limit at the time of the crash, police said. During a court appearance, Broward Circuit Judge John Hurley raised Alyza Rachel Russell's bond to $450,000, almost seven times the initial amount. Prosecutor Eric Linder and defense attorney Robert Reiff also spoke during the hearing. Jules, 30, and Martindale, 35, were homeless and were regulars at a nonprofit center that helps the homeless, the Sun-Sentinel reported. David Nunez, who represents Martindale's family, said the family didn't want to go through a drawn-out lawsuit. "A human life is priceless," Nuñez told the Sun-Sentinel. "But when you put things in perspective, it was in the best interest of the family to take this settlement and turn this page and move forward." Robert Zarco, an attorney who represented Russell, confirmed the deal. "The family is very sorry about the incident, a tragic accident that affected many lives, including that of Alyza Russell," he said. "However the family has, in fact, entered into a fair and reasonable settlement with the family of the victims."